1. Zinc is a $34 billion per year market. It’s bigger than the silver ($18 billion), platinum ($8 billion), and molybdenum ($5 billion) markets combined. In fact, it is the fourth-most used metal worldwide. 2. Zinc smelting and production technology came way later than it did for other metals. The ancients were able to smelt copper, lead, and iron, but it wasn’t until much later that people were able to work with zinc in any isolated state. 3. Even despite this, it was a crucial metal for ancient peoples. They would smelt zinc-rich copper ores to make brass, which was used for many different purposes including weaponry, ornaments, coins, and armor. 4. 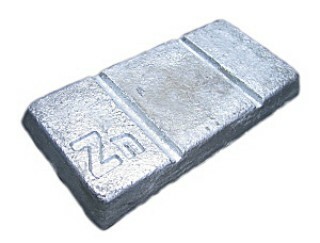 Zinc is also crucial to produce many alloys today. For example, brass is used for musical instruments and hardware applications that must resist corrosion. Solder and nickel-silver are other important alloys. 5. The world’s first-ever battery used zinc as an anode. The voltaic pile, made in 1799 by Alessandro Volta, used zinc and copper for electrodes with brine-soaked paper as an electrolyte. 6. The metal remains crucial for batteries today. Zinc-air, silver-zinc, zinc-bromine, and alkaline batteries all use zinc, and they enable everything from hearing aids to military applications to be possible. 7. Galvanizing is still the most important use. About 50% of the metal is used in galvanizing, which is essentially a way to coat steel or iron so that it doesn’t rust. 8. China is both a major producer and end-user. China mined 37% of the world’s 13.4 million tonnes of zinc production in 2015. It consumed 47% of the world’s supply that same year. 9. Major mines have been shutting down. In 2016, China ordered the shutdown of 26 lead and zinc mines in parts of the Hunan province for environmental reasons. Meanwhile, Ireland’s Lisheen Mine and Australia’s Century Mine both shut down last year after being depleted of resources. That takes 630,000 tonnes of annual production off the table. Warehouse levels are less than half of where they were in 2013. 11. Zinc has been one of the best performing metals in 2016 in terms of price. It started the year around $0.70/lb, but now it trades for $1.04/lb. Global markets were battered brutally in January, the worst since the financial crisis in 2008. Circuit breaker mechanism, which was introduced in January to cushion the Chinese equity markets from excessive volatility, ironically spurred panic and hurt global market sentiments. Amidst such gloom, the only metal which stood the test of time was zinc, thanks to the supply tightening measures by major producers. Australia’s giant Century mine and Ireland’s Lisheen mine ultimately called it off earlier this year after proposing output cuts in 2014. Mining company MMG exported its final shipment of zinc concentrate from Karumba, marking the end of production at Century Mine, one of the world’s largest zinc and lead deposits. Another major support came from Switzerland-based mining and trading giant Glencore’s decision to mothball around 500,000 tonnes per year of mining capacity, mostly in Australia and Peru, apart from Europe’s biggest zinc producer Nyrstar’s suspension of its 50,000-tonne-per-year Middle Tennessee mines. This is in addition to Glencore’s announcement in October 2015 that it will cut 500,000 tonnes of annual zinc production, equivalent to around four per cent of global supply. Furthermore, Horsehead Holding Corp, a large US zinc producer, which has been operating for around 150 years, filed for Chapter 11 bankruptcy on February 2, hurt by slump in metals prices and a shortage of cash. Owing to such aggressive supply reductions, Treatment Charges (TCs) or fees paid by miners to smelters to process raw material into metal has tumbled to around $125 a tonne from $220 a few months ago. The closure of major zinc mines has reduced supply, resulting in lower treatment fees charged by smelters. This shows that the concentrate is not as readily available as last year but imports show a positive trend as steel mills gear up for the Chinese production of galvanised steel products. Recent data released by the General Administration of Customs showed refined imports of zinc soared by 150 per cent in January. Zinc imports surged by 440 per cent in December 2015 after shipments nearly quadrupled in November and almost tripled in October. 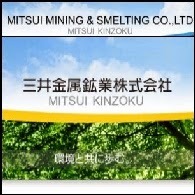 Taking tightening measures into consideration, Mitsui Mining & Smelting Co., Japan’s top zinc supplier, stated that zinc market balance is likely to shift to deficit of 440,000 tonnes, the most in more than a decade and prices likely to surge by about a third in 2016. Along with supply constraints, demand prospects too brightened as Chinese car sales were up 9 per cent year-on-year in January after rising 13.4 per cent in the fourth quarter of 2015 from the corresponding period of last year. Global automotive market is a large component of demand for zinc and numbers show the industry remains robust. 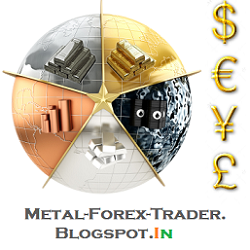 Overall, output cuts and anticipation of higher deficit in 2016 place the grayish white metal in a win-win situation. 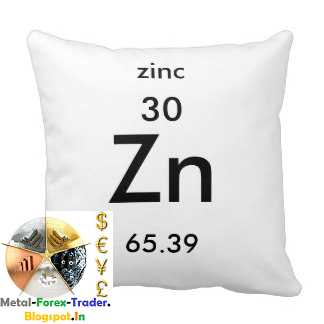 Hence, we expect zinc prices to trend higher from a two-month perspective and LME zinc (CMP: $1,808) prices can possibly head higher towards $2,000/tonne while MCX zinc (CMP: ₹121.35) prices may surge towards ₹140/kg as rupee depreciation towards 70-mark will also be a supporting factor. Deutsche Bank's bull case on zinc had been severely dented over the past three months. A strong USD combined with Chinese demand fears has seen a build of shorts on the LME, and prices collapse by $800 a ton since the beginning of May. Glencore’s bold step of closing a similar amount of capacity is likely to squeeze out short positions, and lead to a deficit market of c.500kt in 2016E. This would be the fifth year in a row of zinc deficits, and Deutsche Bank forecasts the zinc price to recover and average $2,275 a ton in 2016E. However, zinc prices at London Metal Exchange settled down by 0.64% to $1805.50 a ton on Thursday, while inventories down by 1050 tons to 587200 tons. LME zinc surged by about 2% to climb above $1,700 per ton, and the most actively-trade zinc contract on the SHFE also rose to around 14,000 yuan per ton after Glencore’s cut news. Glencore said on Friday it will cut 500,000 tons, around one third of its annual zinc output, of global zinc production due to low prices. 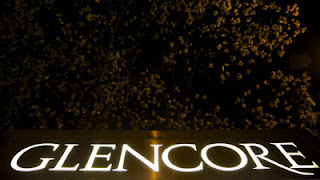 How Glencore’s cut news will affect zinc market? “Zinc prices, in the short term, will get a boost from the cut news, but its weak fundamentals will not allow a sustainable price rise,” an analyst from Guosen Futures told SMM in the latest interview. Poor zinc consumption in China, due to a slowing economic growth, is the leading reason behind sluggish zinc prices, the analyst pointed out. “Weak demand is now in marked contrast to high utilization rates at domestic zinc smelters facing high TCs, especially when a traditionally peak demand season in October also fails to materialize so far this year,” the analyst explained. The global zinc market is also not in good shape, despite no big rise or even a slight drop in LME zinc inventories, as unreported zinc inventories are estimated to be huge. Glencore will temporarily suspend operations at Lady Loretta and reduce production at George Fisher and McArthur River operations, the company announced on Friday. ABC News reports that 242 workers will lose their jobs at Lady Loretta Mine while while 224 positions will be lost from George Fisher, and 69 at the McArthur mine. The closures gave zinc a bump. The Wall Street Journal says zinc rose 6.7% on the London Metal Exchange today. 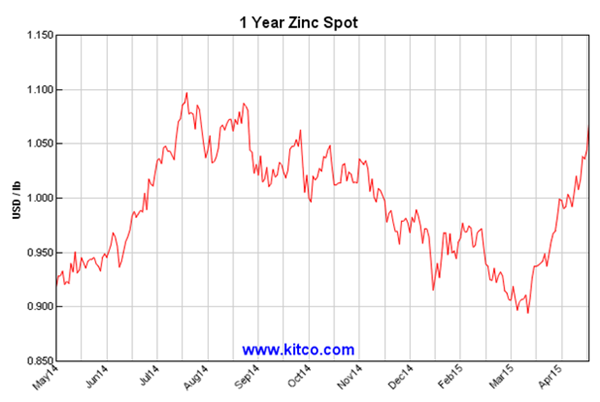 Before the news, zinc had dwindled to a five year low, dropping to 72 cents USD/lb late last month. The metal had a 52-week high of $1.09 USD/lb. Glencore plans to reduce annual zinc metal mine production across its operations in Australia, South America and Kazakhstan by approximately 500,000 tonnes or one-third. There was no news on how operations outside of Australia would be impacted. "Glencore remains positive about the medium and long term outlook for zinc, lead and silver, however we are taking a proactive approach to manage our production in response to current prices," said the company in a statement. The company said it has invested over $1 billion across our zinc operations, and it will continue to fund several large scale projects at our operations. The company regrets the closures. "These changes, although temporary, will unfortunately affect employees at our operations. This decision has not been taken lightly. In the coming days we will engage with all employees and put in place support services to assist our people who may be affected as a result of these changes." Lady Loretta—a zinc (sedimentary exhalative) deposit, with additional occurrences of copper, lead, and silver—is located in Australia about 140km NNW of Mt Isa. The mine is an underground operation, employing long-hole stoping technology. The production restrictions for environmental protection inspections ahead of the 70th anniversary of the victory of the War against Japanese Aggression will significantly impact zinc consumption, SMM says. Beijing, Tianjin, Hebei, Shandong, Shanxi, Henan and Inner Mongolia will execute restrictions on production to secure air quality for the big parade due to the 70th anniversary of the victory of the War against Japanese Aggression, SMM learned. The production restrictions across the tire sector in Shandong will take a toll on zinc oxide demand. Most of tire producers in Shandong’s Dongying will be forced to cut output. Shandong has over 300 tire producers which produce 60% of the total tire output in China. Over 170 low-end tire producers are located in Dongying. Most galvanized plate producers in Hebei’s Bazhou will also be forced to cut output, including large galvanized tube producer Hengshui Jinghua and Handan Youfa. Hebei and Tianjin have an agglomeration of galvanizers, which consume nearly 30% of China’s zinc output. Operating rates at galvanizers and zinc oxide producers will thus slide further in August, SMM foresees, dampening zinc consumption. According to the latest published metals balances report by the World Bureau of Metal Statistics (WBMS), the worldwide zinc market has recorded a marginal surplus during January to May this year. During the entire year 2014, the global zinc market had recorded deficit. As per WBMS data, the global zinc market recorded small surplus of 214 kt during the initial five months of the year from January to May in 2015. It should be noted that the worldwide zinc market had reported a deficit of 145 kt during the entire year 2014. Global refined zinc production witnessed rise of 8.2% during the five-month period. The Chinese production of locally refined zinc surged higher by nearly 14.4% when compared with the corresponding five-month period in 2014. The global demand for the metal has declined by 49 kt when matched with January to May in 2014. The Chinese apparent demand fell by 0.2% over the previous year to 2,522 kt. It accounted for just under 46% of the global refined zinc demand. The Japanese demand for the metal dropped 18% when matched with the levels recorded during Jan-May ’14. The Japanese demand during the five-month period totaled 171.9 kt. The reported stock of the metal has declined by 75,000 tonnes during the five-month period. The LME zinc stocks declined by 15.9 kt during the month of May and accounted for 41% of the global stock of the metal. The Chinese zinc metal imports reduced significantly by nearly 43% during Jan-May ’15 to 178 kt when compared with the imports of 311 kt during the same period last year. LME zinc prices are expected to point toward $ 2,100 next week, moving between $ 2,050-2,120 per ton, SMM zinc analyst predicts. "Zinc prices appear to be more resistant to declines among other base metals, and investor confidence will improve after some mines lowered domestic zinc concentrate TCs due to tight supply in South China”, SMM zinc analyst explains. A technical indicator also shows significant support to LME zinc price. But a strong US dollar will constrain some price gains, SMM added. In China, September-delivery zinc contracts on the SHFE will consolidate support from the 5-day moving average, fluctuating in the 15,500-16,000 yuan per ton range. SHFE zinc price will underperform LME zinc with the lack of market confidence from soft domestic demand. Spot price in Shanghai will trade 0-60 yuan per ton below SHFE zinc contracts for September delivery. Supply grew recently as smelters increased sales with rising zinc price. A narrowing price gap between Shanghai and Tianjin will also drive more shipments to Shanghai. Purchases will be sluggish, though. Traders will be reticent toward goods releases after delivery, and downstream buying interest will be also weak, allowing spot discounts to expand. TCs for domestic zinc concentrate will rise on growing supply. "Zinc concentrate imports are expected grow on increasing margins”, zinc analyst explains. Profit from imported zinc concentrate increased 170 yuan to 520 yuan per ton (zinc content) above those from domestic concentrate this past week. Recent rainstorms in Hunan and Guangxi have little impact on local mines due to suspension across SMEs from environmental protection inspections and stable production at large mines. Some mines were reluctant to sell on continuously falling zinc prices. This week, TCs for imported zinc concentrate (50%) were $ 210-220 per dry metric ton (DMT), while those for domestic zinc concentrate (50%) were 5,300-5,500 yuan per ton (zinc content). 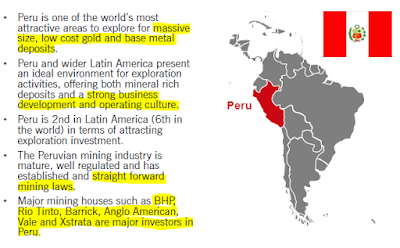 The production of almost all major metals by Peru reported robust growth in Peru during the month of April this year. While the output of copper, gold and zinc reported significant increase during the month, silver production declined, in accordance with the official government data released yesterday. According to data released by the Energy and Mines Ministry, copper production rose 18.5% from 103,410 mt in April last year to 122,506 mt in Apr ’15. The decline in copper output from Freeport-McMoRan's Cerro Verde was offset by increased mine output from Antamina, Southern Copper, Toromocho and Antapaccay mines. The increased output from Newmont and Barrick gold mines contributed to the 15% growth in gold production during April this year. The gold production totaled 379,504 Oz in Apr ’15, in comparison with the output of 330,273 Oz during the same month a year before. Silver production dropped marginally by 0.4% over the year from 9.57 MOz to 9.53 MOz in April. The output from Antamina mines dropped significantly, whereas Buenaventura and Volcan reported rise in silver production during the month. Zinc production rose 17.7% from 97,128 mt a year before to 114,323 mt in Apr ’15. Lead output too rose 27% from 97,128 mt to 114,323 mt over the previous year. Lead output witnessed sharp increase in Antamina, Volcan and Milpo. Molybdenum output too jumped 45% to 1,632 mt in April 2015. Meantime, tin production by Minsur- the country’s only tin producer, rebounded sharply in April this year, rising nearly 15% from 1,438 mt in April 2014 to 1,654 mt in April this year. The possible delay of new standards for compound rubber will have positive impact on zinc oxide consumption, Shanghai Metals Market foresees. China is due to implement new standards for compound rubber on July 1, 2015, but market players speculate that the standards might be carried out later than scheduled. Zinc producers, along with investors, have been hoping for a supply crunch to materialize after repeated warning of mine closures and predictions of ore shortages, but supply has remained stubbornly robust. deficit for this year of 366,000 tons, a figure more than halved to 151,000 tons this month, and itself still higher than a recent Reuters poll predicting a 143,000-ton deficit for the year. Overall, about a million tons of supply will eventually be taken out, Robin Bhar of Societe Generale predicts, but one unknown is how much mothballed production could come back onstream. At $2,200 per metric ton most miners are operating profitably, a 10% rise (we have seen this much already over the last two months) would probably seal the case for restarts, in addition to several smaller projects already in the pipeline. Some point to falling London Metal Exchange inventory as a sign of deficit but to what extent this is metal coming off-warrant to be moved into lower rent non-LME storage is not clear. 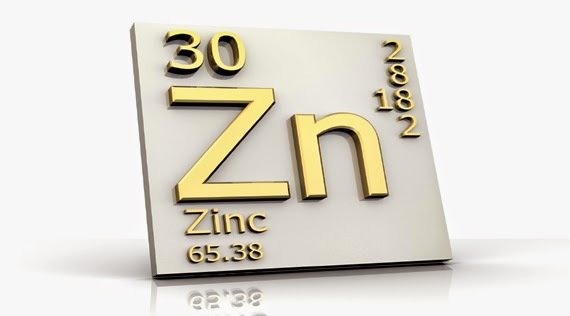 Zinc has suffered from the same distortion as aluminum in recent years, with the stock and finance trade soaking up a percentage of production and inflating the impression of apparent demand. The current LME forward curve does not support that trade at present, but that doesn’t negate the fact a significant percentage is still locked up in those deals. For now there is ample ore supply, Reuters reports, as evidenced by treatment charges that have risen to $245 an mt, a 10% gain, from last year. To clear up a misconception, treatment charges rise with supplies as mining groups compete to find smelters to process their material. This year, the Chinese domestic zinc market is expected to be in surplus as domestic output and imports rise, while demand for the metal weakens. A slowing manufacturing sector and tightening environmental standards could also trim zinc demand sapping expectations of a rise in demand. Against such a backdrop the rally in prices seen in recent weeks could be said to be overly bullish, fueled as it is by falling inventory and expectations of a looming supply crunch, the current market realities don’t support a near-term supply shortfall, but markets are said to trade on expectation so maybe investors’ optimism about higher prices is right, just ill-timed. (Reuters) - Too often in previous years those betting on higher zinc prices have suffered burnt fingers, but for now some are cautiously optimistic that a deficit and falling stocks will buoy prices. Historically, supplies of the metal -- used to galvanise steel -- go from feast-to-famine as miners ramp up output when prices rise and cut when prices fall. However, producers are now more wary and are looking for sustainably higher prices to boost and protect profit margins. "Zinc does come with baggage, it's destroyed a lot of shareholder value. Miners are being careful," said Robin Bhar, metals analyst at Societe Generale. "But demand is healthy and supplies are falling ... Mines have closed and more are due to close. Overall about a million tonnes of zinc in concentrate will be taken out." Planned closures include the Century mine in Australia owned by China's MMG and Vedanta Resources' Lisheen mine in Ireland. Restarts of existing mines such as Teck Resources' Pend Oreille and Trevali's Caribou zinc mine could take up some of the slack. But new projects such as Vedanta's Gamsberg in South Africa will not be producing for a couple of years. 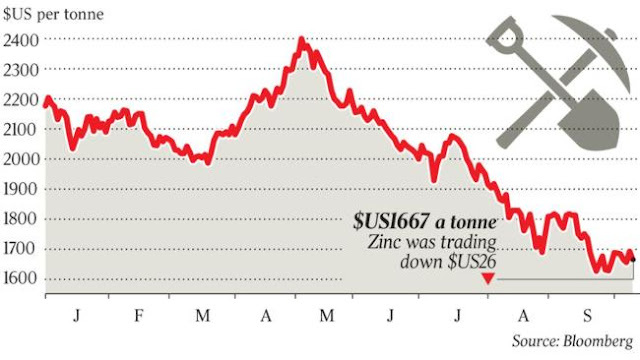 Zinc prices at around $2,200 a tonne may be high enough for some to contemplate restarting mothballed mines. "Another $200 or $300 would make a much stronger case," a producer said. "There's plenty of (concentrate) supply at the moment for smelters." Some are concerned about China's zinc exports, which are climbing. But at 39,489 tonnes between January and March, they are for now a fraction of total demand estimated at nearly 14 million tonnes this year. Ample supply of zinc concentrate can be seen in treatment charges, which have risen to $245 a tonne, a 10 percent gain, from last year. Treatment charges rise with supplies as mining groups compete to find smelters to process their material. 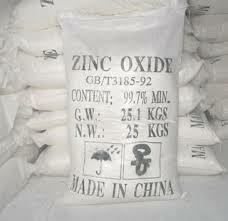 Zinc rose more than 15 percent between November 2013 and July 2014. It fell back about 10 percent to below $2,000 a tonne between July and mid-March. Since then expectations of a deficit, 145,300 tonne this year according to a Reuters survey, mine closures and falling stocks have pushed prices back up. "The deficit will rise. The big question is how stocks of metal and concentrate accumulated in recent years ," said Graham Deller, analyst at consultants CRU. "Century and Lisheen are eventually going to make a difference." Zinc stocks in LME-registered warehouses at around 486,850 tonnes have tumbled more than 30 percent since last September and compare with levels above 1.2 million tonnes in June 2012. Data from the International Lead and Zinc Study Group showed producer and consumer stocks of refined zinc at around 1.5 million tonnes in February. "A deficit will result in a drawdown of inventories," said Andrew Thomas, a zinc analyst at consultants Wood Mackenzie. Zinc prices will have a big chance to rise during the second quarter of the year. Production worries from environmental drive and demand expectations following China’s One Belt, One Road policy, and loosing in housing market will be the major price driver, Jinyou Futures said to SMM. The ongoing stricter environmental protection inspections across the nation, especially in some regions, will prevent utilization rate at domestic zinc smelters from rising significantly, and this will serve as a major supporter to zinc price. The US’s potential hike in its interest rate, however, will be negative to zinc price, but the supply and demand side will remain the leading factor. 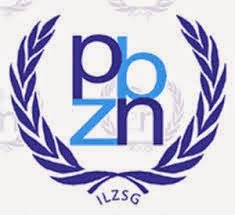 The latest statistics published by the International Lead and Zinc Study Group (ILZSG) indicates that global refined zinc market was in deficit of 296,000 tons during the year 2014. The total reported zinc inventories declined by 321,000 tons during the year. The zinc mine output reported declines in Australia, Canada, India, Kazakhstan, Namibia and Peru. However, the fall in output was covered with the increased mine output from other countries including China. Overall, the zinc mine output grew by 1.4% during the year when compared with the previous year. The refined zinc metal production during the year totaled 13.513 million tons, 5% higher when compared with the 12.873 million tons output during 2013. The rise in refined zinc metal output was mainly due to increased output from China. The Chinese refined zinc metal output surged higher by 14.3% over the year. The global demand for refined zinc metal increased by 6.5% to 13.809 million tons during 2014. The Chinese apparent usage increased by 11.7%. The imports of refined zinc metal by the country during 2014 totaled 439,000 tons, down almost 30% when matched with the previous year. The refined zinc metal usage ex-China increased by 2.3% mainly on account of increased usage reported from Korea, Mexico, Taiwan and the United States. The global mine production during the year totaled 13.372 million tons. The global zinc mine production during the month of Dec ’14 alone totaled 1.144 million tons. The refined zinc metal output during the month totaled 1.192 million tons. The global demand for the metal totaled 1.177 million tons during the month. Nyrstar NV, the world’s largest refined- zinc producer, expects the price of the metal to increase further after the 500,000 metric ton Century mine in Australia shuts by the end of the year. "We are heading into a period that is forecast to be short on both the concentrate market and the refined metal market,” Heinz Eigner, acting chief executive officer of Belgium-based Nyrstar, said in a phone interview. “This double deficit” is pushing the metal into a “very strong price range,” he said. Zinc prices gained 6 percent last year amid speculation supply will fall short of demand as some mines shut. Stockpiles in warehouses tracked by the London Metal Exchange are at the lowest since October 2010. Strong consumer demand has helped buoy zinc, Australia & New Zealand Banking Group Ltd. said in a report Thursday. Century, Australia’s largest open-cut zinc mine operated by MMG Ltd., the Hong Kong-listed unit of China’s biggest state-owned metals trader, is scheduled to shut in the third quarter. Lead usage In the United States increased by 3.9% during January to November, while demand Europe declined by 1.6%. According to International Lead and Zinc Study Group, an increase in global demand for refined zinc metal of 5.4% was primarily a consequence of a reported rise in Chinese apparent demand of 10.5% during January to November. The global market for refined zinc metal was in deficit by 255kt over the eleven months from January to November 2014 with total reported inventories declining by 326kt over the same period, said ILZSG report. Falls in zinc mine output in Australia, Canada, India, Ireland and Namibia were more than balanced by increases in China, Mexico, Peru, Sweden and the United Sates resulting in an overall global rise of 1.9%. Despite reductions in India and the United States, world refined zinc metal production rose by 4.2%. This was due mainly to higher output in China.